Home / appliances / big big sale / blender / bonifacio global city / coffeemaker / discount / electrolux / flat iron / home / home appliances / rice cooker / sale / vacuum cleaner / It's the Electrolux Big, Big Sale! It's the Electrolux Big, Big Sale! Happening this coming Wednesday, Electrolux fans will surely have a great time availing some appliances from their most trusted appliance as they hold their annual Small Appliances Big, Big Sale! 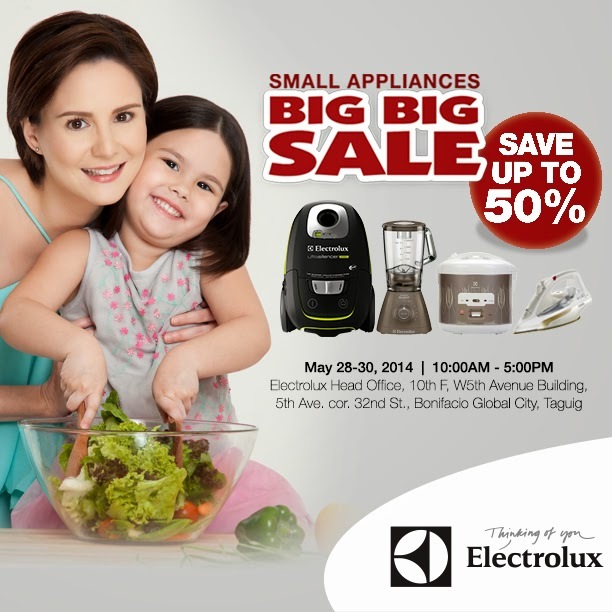 Save up to 50% on your every purchase, Electrolux's Small Appliances Big, Big Sale will be happening at the Electrolux Head Office, which is located at the 10th floor, W, 5th Avenue Building in Bonifacio Global City, Taguig. From vacuum cleaners, coffeemakers, flat irons, rice cookers and blenders, Electrolux keeps true to its promise of "Thing of you" as they share these amazing innovations at a very affordable price. It's gonna be another crazy pay day weekend, and now you where's the best place to spend your hard-earned money!